Your crank case builds up high pressure with high RPMs and boost. The breather hose relieves this pressure. In lower power levels and a good solid motor, oil vapor is minimal so a catch can is not necessary. During track or hard street use when you are running long periods of high RPM the pressure can distribute oil and moisture out of the valve cover port. Oil accumulation in the intercooler or intake will hurt efficiency. For occasional track days or a dedicated track car, we strongly recommend the use an oil catch can. 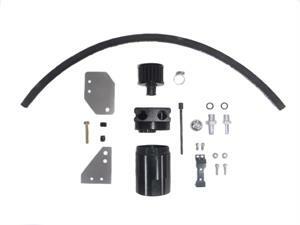 The TDR oil catch can kit consists of an oil-resistant black aluminum container with 3/8 inch (10 mm) and 7/16 inch (12 mm) fittings, air filter, mounting plate and braided hose. The catch can includes a dip-stick for checking oil level. Normally you would connect the catch can to your crankcase relief port on your valve cover. Optionally you can modify your PCV valve hose arrangement. If you need to drain oil from the catch can, the base reservoir threads off from the bottom. 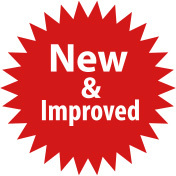 The air filter can be removed and cleaned if necessary. This kit reroutes the idle air bypass hose, cleans up the engine bay area and improves the air filter area for the TDR Air Filter Kits. This kit is for the dummy throttle body side M45 Supercharger. Required with the JR Bypass Kit 1 when ordered for stand-alone (non-intercooler) M45 Supercharged setups. Some Jackson Racing M45 Supercharger kits came with an idle air check valve that mounted in the 3/4" bypass hose, good for about 0.5 PSI of boost.